FraudLabs Pro allows user to configure multiple fraud validation rules with multiple actions, such as Approve, Manual Review, and Reject. But, how is the sequence of execution if I had configured multiple validation rules with different actions? Below are the explanation of the execution logic. If match found during the sequential check, stop the checking process and flag the transaction based on the action defined, such as Approve, Manual Review or Reject. If sequential check completed with no match found, flag the transaction as Approve. Scenario 1: User’s email address is a yahoo email. The validation process will be stopped at Rule #1 and the transaction will be flagged as Manual Review. Scenario 2: User’s email address is a company email but had been previously blacklisted by FraudLabs Pro. Rule #1 pass the validation. 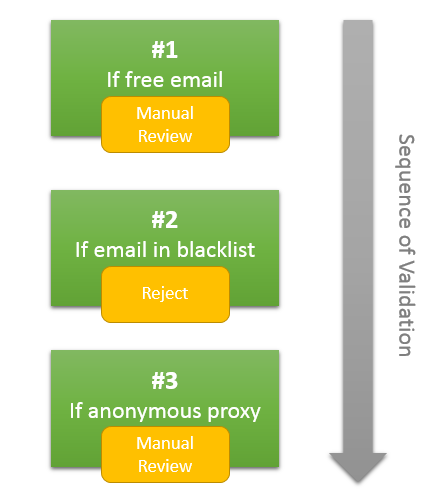 However, the validation process will be stopped at Rule #2 and the transaction will be flagged as Reject. Scenario 3: User’s email address is a company email with clean record, and not using Anonymous Proxy. The validation process completed successfully and the transaction will be flagged as Approve. 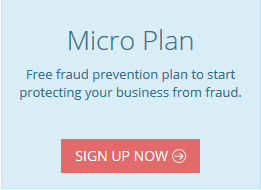 Have you created your fraud validation rules? Not yet? You may now login to your merchant area and start creating your own validation rules.